The House of the Seven Gables isn't alone. There are several other films that have inspired McCall patterns during this time period. One that I particularly love is Pinocchio! Oh dear! How cute is that? Hail, Pinocchio! The 1940 Movie star gets a warm welcome from McCall with three new Pinocchio patterns. 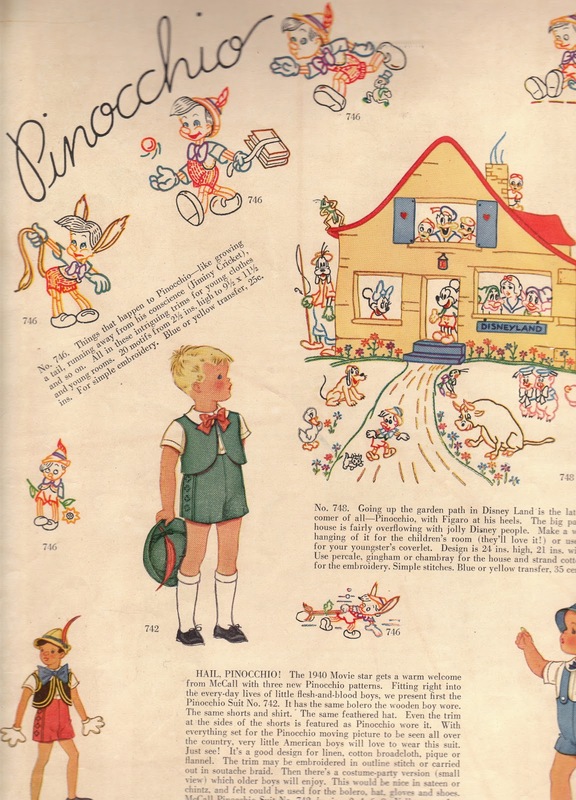 Fitting right into the every-day lives of little flesh-and-blood boys, we present first the Pinocchio Suit No. 742. It has the same bolero he wooden boy wore. The same shorts and shirt. The same feathered hat. 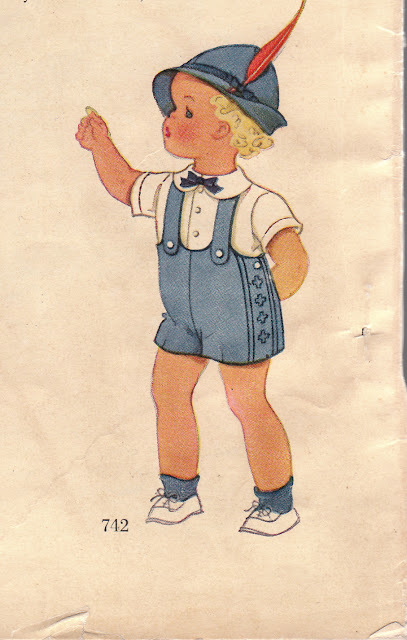 Even the trim at the sides of the shorts is featured as Pinocchio wore it. With everything set for the Pinocchio moving picture to be seen all over the counry, very little American boys will lvoe to wear this suit. Just see! It's a good design for linen, cotton broadcloth, pique or flannel. The trim may be embroidered in outline stitch or carried out in soutache braid. Then there's a costume-party version (small view) which older boys will enjoy. This would be nic ein sateen or chintz, and felt could be used for the bolero, hat, gloves and shoes. I also just saw this pattern on ebay--I hope whoever bought it, sews it up for a little boy...it really is just so adorable! So cute! If I have children, they will have mortifying outfits like this.